Home / Blog / How Many Times Can You Violate the FDCA in One Marketing E-mail? How Many Times Can You Violate the FDCA in One Marketing E-mail? I’ve blogged before about the explosion of amniotic and cord vendors illegally claiming live stem cells in their products. It would be easy to look the other way if any of this were verifiably true, but near as I can tell, it’s all incomplete data designed to push product down the throats of gullible physicians. In fact, because most physicians have taken the time to educate themselves, we primarily tend to see acupuncturists and chiropractors who seem to be the ones biting the magic stem cell messaging. This morning’s ridiculous e-mail comes from a product called “StemShot,” which likely wins my “Most Violations of the FDCA in a Single Communication” award. I was forwarded this e-mail by several colleagues this week as it seems to have been part of an e-mail blast that was sent out to many physicians. The e-mail ad is hawking StemShot and StemVive, manufactured by the Utah Cord Bank. The bizarre thing here is that this ad wasn’t sent by the company that makes StemShot, but an orthopedic sales rep called Apex Biologx. This is concerning, as if the manufacturers decide to break the law, then a sales rep should distance themselves from that event. By amplifying the messaging here, Apex is making itself liable under 21 USC 331(c). Meaning that Apex, by selling and promoting a misbranded and adulterated drug product, is liable and can be prosecuted right along with the manufacturer. First, realize that the FDA is a claims made regulatory system. Meaning, if you are selling a vial full of dead or dying cells and you claim that they are alive and can heal tissue, just the claim is enough to change your regulatory status from a tissue to a drug. Whether the claim is actually true or not is typically something for the Federal Trade Commission (FTC) to address pursuant to its decades-old Memorandum of Understanding with the FDA. So while I highly doubt that these products contain live and viable mesenchymal stem cells that would pass muster using the ISCT standards, whether they do or don’t is actually something that could be addressed by multiple federal agencies as well as consumer protection agencies in the individual states, and, of course, private litigators. Just the names “StemShot” and “StemVive” are problematic. Any reasonable person would interpret that these are stem cell products solely based on what the company chose to name these 361 tissues. 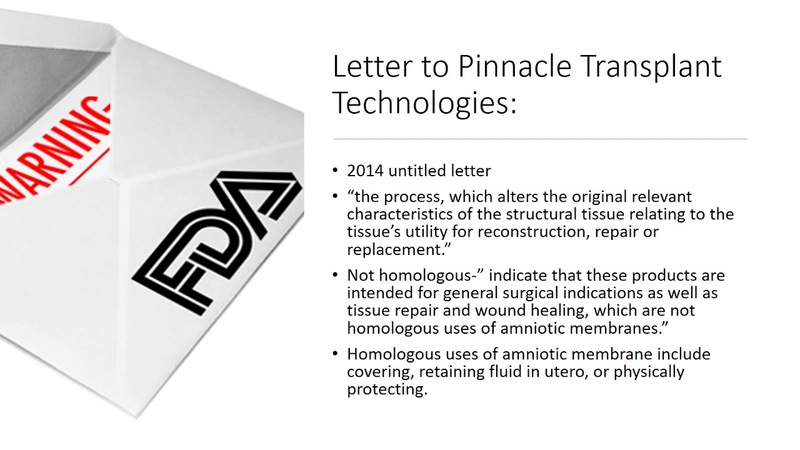 This part is deceiving and counts on the fact that most physicians won’t know that the only homologous use the FDA recognizes for umbilical cord products is hematopoietic reconstitution in cancer care. Given that this e-mail was clearly targeted at an orthopedic and pain management list and not pediatric cancer specialists and given that there is no orthopedic or pain use that the FDA considers homologous, this is saying that you can only use this product for cancer care, but avoiding the details that would reduce the market size. I have bolded the parts above that are problematic. Claiming that this is a “stem cell product” is a direct violation of the FDCA. Why? The implication is that stem cells in the products are the active ingredient and these cells derive from a donor source, making this a 351 drug product requiring full FDA clinical trials per medical indication and not a quickie 361 45-minute registration. To dive deeper, under the 21 CFR 1271.10 regulation test, if the product is a “stem cell” product and neither autologous nor used in a close relative, it is a 351 drug product. Also, notice that a claim is made about the product being able to repair tissue and that it is more effective than competitor tissues. Both of these claims can’t be made about a 361 tissue. What can the manufacturers say? They can make claims about what the tissue is or isn’t, how it’s processed, and its basic properties. 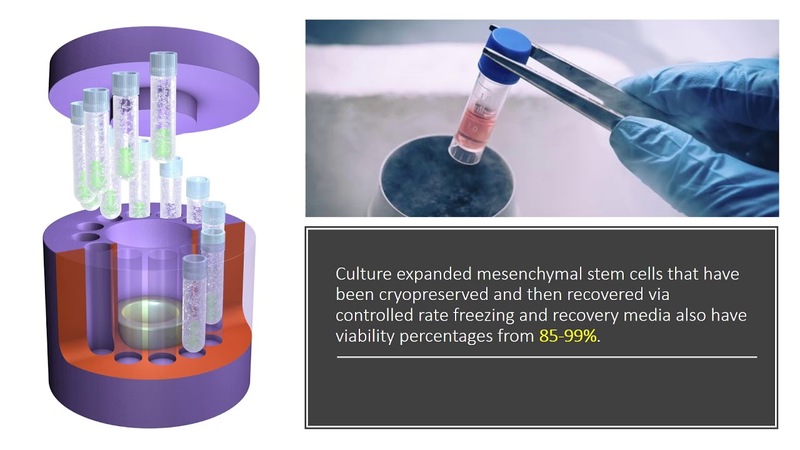 There is a standard series of tests that has existed for a long time in the mesenchymal stem cell (MSC) research world that serve as the minimal requirements for saying you have live and functional cells. These are called the ISCT standards. They provide standardized bars to jump over that all of these amniotic and cord tissue vendors have thus far ignored. 2. Plastic adherence in culture. The cells must adhere to plastic and form colonies. StemShot claimed to show that they had a colony of stem cells. Below I have included a picture of that colony and what a real stem cell colony from bone marrow looks like: 3. Trilineage differentiation. 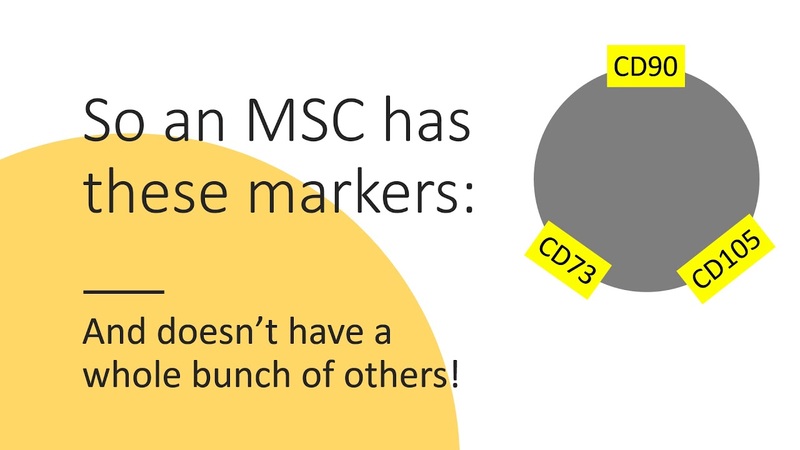 The cells in culture have to be able to differentiate into bone, cartilage, and fat to prove they are multipotent MSCs. I have never seen any company provide this test. The upshot? I have no idea why an orthopedic sales rep company would want to get involved in assisting an umbilical cord-tissue manufacturer in violating the FDCA. In addition, I have yet to see any company, including the Utah Cord Bank, provide the standard ISCT testing required to make a claim of live and functional mesenchymal stem cells. MY DAUGHTER HAS BEEN PAYING TO KEEP HER BABY'S UMBILICAL CORD FROZEN FOR FOUR YEARS ... IN CASE STEM CELLS ARE NEEDED AT SOME FUTURE DATE. WHAT SHOULD I TELL MY DAUGHTER ABOUT THIS? DOES IT MAKE ANY SENSE AT ALL? Currently, as per the FDA, for the baby, and first and second degree relatives: "Cord blood is approved only for use in “hematopoietic stem cell transplantation” procedures, which are done in patients with disorders affecting the hematopoietic (blood forming) system. Cord blood contains blood-forming stem cells that can be used in the treatment of patients with blood cancers such as leukemias and lymphomas, as well as certain disorders of the blood and immune systems, such as sickle cell disease and Wiskott-Aldrich syndrome."